When I want to listen to some good music, I fire up muine, then click on the Add Album button. Now what album to choose ? Every time it’s the same thing I just can’t choose an album and play it. I decided to fix that by adding a Random button that will just select and queue for me a random album ! What a pleasure to just let the random magic do its work. 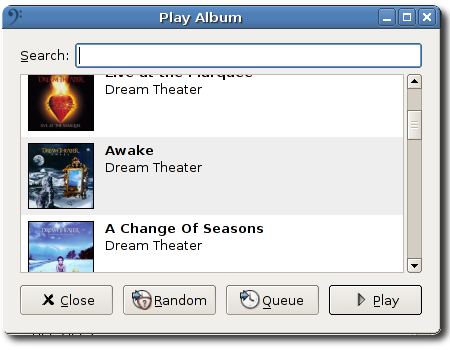 Click on random, a random album/song is queued in the playlist and the window stays open so you can click two or three times to have two or three random albums/songs queued.